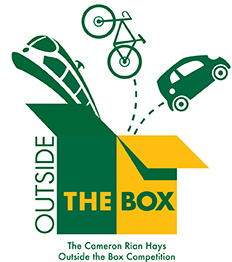 DC Area Event Alert: Cameron Rian Hays Outside the Box Transportation Innovations Conference – Friday June 27th – Registration Open!! In the world of transportation and transportation challenges, it is imperative that we foster the development and implementation of new ideas. Instead of offering the same old solutions – turning the proverbial wheel, but not moving forward – the Cameron Rian Hays Outside the Box Competition and Conference encourage young professionals to think creatively and offer new and innovative solutions to complicated transportation policy challenges. From a pool of outstanding and creative entries, 3 winners will be selected! Come celebrate with them and be part of the conversation! Join us at 2:30pm in Founders Hall on the Arlington Campus of George Mason University for presentations and panel discussions of the 3 winning entries. Dr. Laurie Schintler will moderate our esteemed Blue Ribbon Panel, including Shailen P. Bhatt, Secretary of the Delaware Department of Transportation, Hooks Johnston of Valhalla Partners, John G. Milliken, Esq. of Venable LLP and Art Guzzetti, Vice President of Policy for APTA as they discuss the innovations proposed by the winning young professionals, with an opportunity for audience Q&A. Last year’s winner, Jossie Kressner, Ph.D. will share the progress she has made since winning the competition. New this year – Come hear Keynote Speaker, Gil Penalosa, CEO of 8-80 Cities share his ideas on how to create vibrant and healthy cities for all. We’d like to know you’re coming! Please RSVP for the event here. Please visit the competition website for details on the venue and agenda.